Merry Christmas and Happy Hanukhah to all my family, friends, followers and fishing enthusiasts. Fall fishing is slowly coming to a close on Norfork Lake and the winter pattern is starting to emerge. 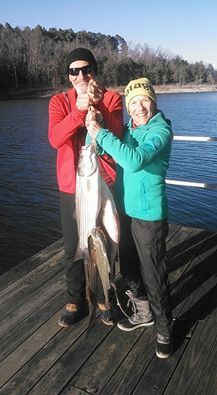 Stripers, hybrids and whites have moved from the shallow flats and are moving to the deeper flats in 60 - 70 ft of water. A lot of the same flats but start looking out farther in the lake. If you have a GPS on your boat you can look at the contour lines to see the areas to fish. This migration of the fish is typical for this time of year. The amount of daylight hours as well as the water temperature causes the bait and fish to move into their comfort zone. The bait has started to move out of the backs of creeks and into the deep water of the creeks as well as the main lake. 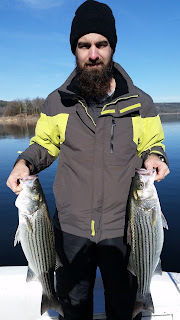 You will still find stripers, hybrids and whites in the major creeks, but start looking in the deep water channels especially if the old river channel swings in close to a bluff line. Large schools of stripers and hybrids are roaming and chasing small 2 - 3 inch bait fish. You might consider using smaller baits at this time. The schools that I have found are suspended down 30 feet and on down to the bottom. A good graph on your boat is definitely a big plus this time of year. I have been mainly vertical jigging with a spoon as shown in one of my photos. I typically have my bait on the bottom jigging and when I see suspended fish above my bait I reel up to them and start jigging though the school of feeding fish. 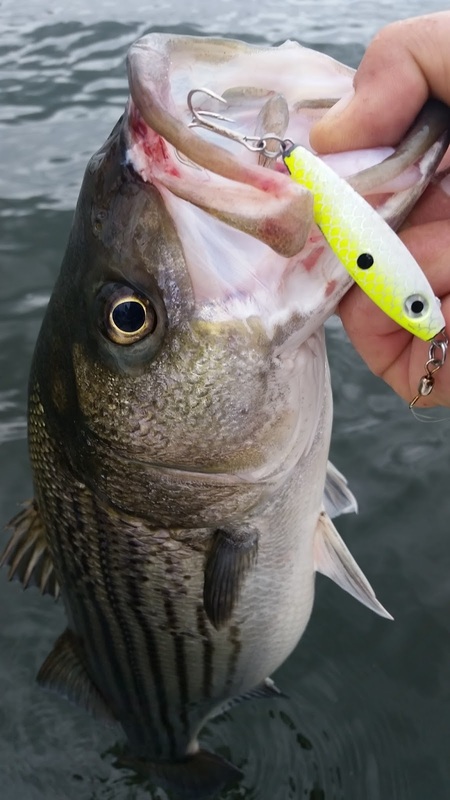 Be ready when you are reeling up to the fish because you never know when a striper will attack your bait and try to yank the rod out of your hands. I am speaking from experience. :-) I have been fishing several different locations, Float and Panther Creeks, Howard Cove Area and Cranfield Area. I have been working the flats as well as the deep water in all these locations. Largemouth bass have moved up into the shallow waters to feed. 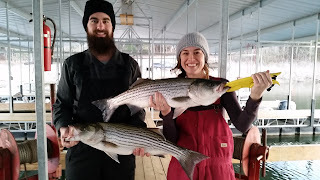 Some nice fish are being caught in 10 - 20 feet of water. I have also noticed a little top water action early in the morning close to the shoreline, both back in creeks, as well as on points of the main lake. Crank baits, spinner baits and of course plastics worked along the bottom have been producing fish. This all being said I have also caught some nice size largemouth vertical jigging in 50 - 70 feet of water. This tells me these fish are also starting to move to their winter pattern. 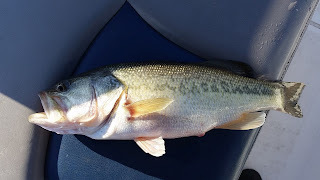 In the past once the water gets in the 40 to low 50 degree range the bass tend to go deep and hang close to brush and deep rocky bluffs and points. Crappie are moving into the the brush and under and around docks. 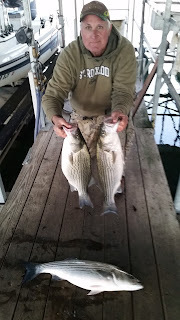 There are some nice fish being caught off of my dock as well as brush in 30 - 40 feet of water. As the water cools a little more, start looking for this species in 50 foot brush piles. I have caught some really big slabs during the cold winter months on deep brush piles. Norfork Lake water level is falling slowly and currently sits at 554.72. The Corps is currently running 1 generator and dropping the lake approximately an inch a day. The main lake is clear and the creeks and coves are still stained but are starting to clear. As the water level stabilizes the water will become very clear. The surface water temperature this morning was 55 - 57 degrees depending what part of the lake I was on. A big Congratulations go out to Hummingbird Hideaway Resort's 2015 fishing derby winners. 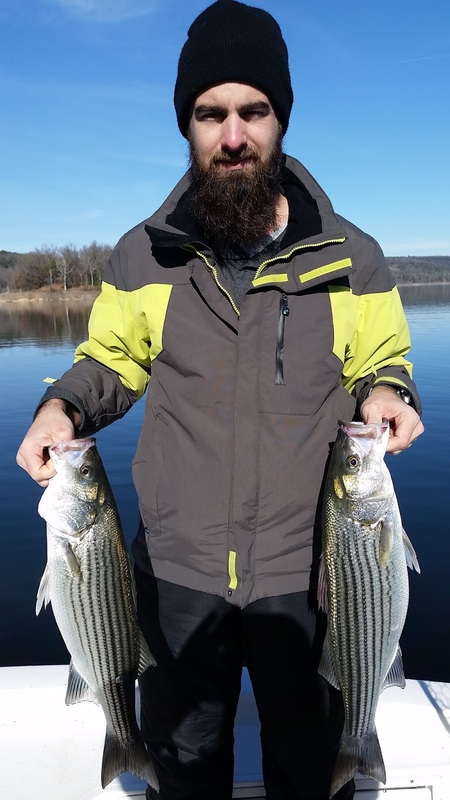 John Fink of St Louis, Mo caught the largest Striper of 39.5 inches on March 20th, Rob Bruce of Troy, MO co-shared the largest Crappie of 15.5 inches on May 17th, and Ron Adams of West Plaines, MO co-shared the largest Crappie of 15.5 inches and also caught the largest Largemouth of 20 inches both on July 6th. Steve Holderman of Augusta, KS won the free week stay at Hummingbird Hideaway Resort. Great job to these winners and all that entered our Derby. We are planning for next years Derby to start March 1, 2016. Watch our website and facebook page for details. Photos of winners below.